Dollar General is offering up a great new digital coupon valid for $2.00 off a $2.01 purchase! This is valid for NEW users only. Dollar General has Purell hand sanitizer on sale this week for only $2.00. With the below manufacturer matchup, you can get it for FREE. 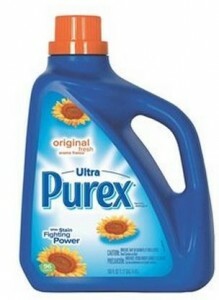 This week (3/9-3/15) you can score Purex Laundry Detergent for Only $1.20 a bottle at Dollar General!